As much as I hate DST, the days aren’t nearly long enough to allow all the work needed to get ready for Sheep Shearing Day. The barn and farm office need to be cleaned out and the barn lot spruced up. Cove Road needs to be trimmed so folks can park alongside the road on either side of the driveway. Older folks and the press may park in the driveway but there’s simply not enough room to allow everyone driveway parking. Of course, Clinton, our shearer, drives right up to the barn so he can unload/load his equipment easily. Clinton is coming around 9 a.m. or after he makes sure his new lambs are on the ground, on their feet. I’ve got to check with my catcher tomorrow to make sure he’s available to catch and hand the sheep off to Clinton. Clinton has, approximately, 600 lambs on the ground and a few are orphans or too many lambs for the ewe to feed. 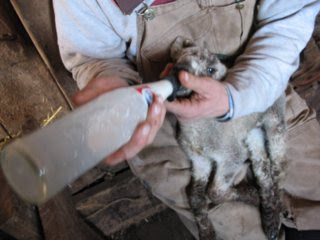 Some have to be bottle fed, like this little one. Today was spent cleaning out the farm office where the Cove Community Center will sell refreshments and lunch. All goodies are home cooked and include brownies, “the real deal” pound cake and other things that escape my memory. There may very well be farm fresh eggs for sale as well. Tomorrow I clean out the barn where the sheep will be placed on Friday and be left until they are sheared Saturday morning. Placing the sheep in the barn overnight ensures the lanolin will rise, making their fleeces easier and more quickly shorn. Shetland cross and the fleece combines the best of both breeds. The fleece is long stapled, perhaps six to seven inches, with a nice, tight crimp and a lovely lustre. 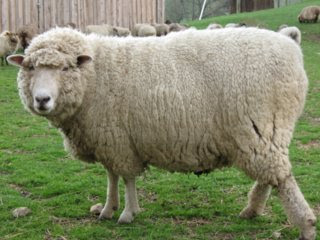 All fleeces are, virtually, free of veggie matter and are well skirted. ~Charlie Butcher with his beautiful, hand crafted four-string mountain dulcimers. If you ask politely…he’ll even play a tune and, perhaps, his children will play their fiddles. ~Larry Counts makes brooms – sweeping brooms, whisk brooms for both car and clothes and a delightful little “broom” that’s used to test cakes. A piece is broken off and inserted into a cake or brownie or whatever…to determine if it’s finished baking. Neat idea! ~Bud Thompson will pound out courtn’ candles and other goodies on his forge. He tells some great stories as well. ~Mary Martin will help with skirting fleeces and will also demonstrate and sell her lovely hand made baskets. ~Richard Vogel is always a show stopper with his antique wood working tools and he sells the very bench you’ll watch him craft. 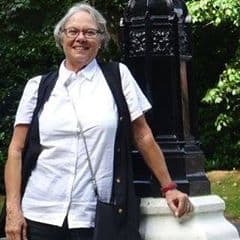 ~Sandra Bennett, that’s me, will demonstrate spinning, maybe some dyeing and have some yarn and roving for sell. Yes, fleeces are sold right off the sheep so all you hand spinners come early to make your selection. Bring your camera, a good appetite and wear comfortable clothing. It’s usually windy and that means a bit of a chill in the air so a sweater or jacket is nice also. Comfortable shoes and service dogs only, please. This is a working farm and my critters tend to freak over “strange to them” dogs. And, my “double nickel” birthday is Friday but I’ll have to celebrate another time. There’s simply too much to do in a too short a time frame to add a birthday celebration in the mix. I’m just thankful to God to see another birthday! Sheep Shearing Day is an opporturnity to share my love of “all things Appalachian” and to celebrate Appalachian heritage and culture. 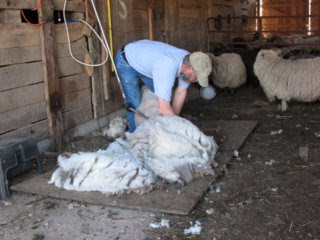 Seems NPR’s Fred Eckles is interested in Sheep Shearing Day as well and is scheduled to interview me on Friday, April 11th, for All Things Considered. It’s a good time to be an Appalachian American! How exciting to be interviewed for All Things! I will have to go look it up! Hope that your “double nickel” birthday was a good one, Sandra! Also, your Sheep Shearing Day! My Dear …. you are a busy lady! Sandra, you inspire me! I appreicate the time you take to post to your blog. Last summer I purchased my first lambs, (Romney’s) for a home supply of wool to spin, and craft with. I’m finding such delight in sheep ownership (so far). ;o) Very different from horses…which I’ve had for 30years. Have a wonderful Birth-Day. And thanks again for the inspiration! Happy Birthday! So sorry I can’t make the shearing day this year!